Hours: M- F, 8 a.m. - 4:30 p.m. 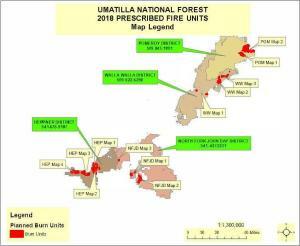 The Umatilla National Forest prescribed fire page contains public information on planned, active and completed prescribed burning for 2018 on the Forest. Burning is planned on each of the four Districts on the Umatilla National Forest. In general, there are two burn seasons each year to accomplish prescribed fire projects. Early season burns typically occur in late winter through the early fire season in late spring/early summer. Late season burns typically occur in late fire season and into December. The specific dates of a burn during a season is dependent on many variables including wildfire activity, resource availability, current and predicted weather, and smoke management constraints. Frequent, low-intensity fire is essential for healthy forests and reducing the risk of uncharacteristic wildfire caused by excessive fuel buildup. Prescribed burning is an effective tool for removing excessive amounts of brush, shrubs, and trees, while also encouraging the growth of native vegetation. NEW! Prescribed Fire Activity Interactive Map (This interactive map will be best viewed using Chrome, Safari, Firefox or Internet Explorer 9 or higher). Check out our interactive prescribed burn map for information on active burn units, burn unit locations and more. This interactive map allows the user to zoom in on certain areas and click on a burn unit for more information (such as acreage, status, etc). The data represents the recently completed, active, upcoming, and out-year prescribed fire planning for the Umatilla National Forest. All units have been analyzed under the National Environmental Policy Act (NEPA). Burning typically takes place once all other activities described in the project analysis have been completed. Prescribed burning is highly dependent on precise weather and fuel conditions, and managers coordinate with the Oregon Department of Forestry to minimize air quality impacts to local communities. Prescribed burning is highly dependent on weather conditions. Conditions have to be within narrow criteria window in order to use prescribed fire. Wind speed and direction, temperatures, relative humidity, and fuel moistures are all taken into consideration.